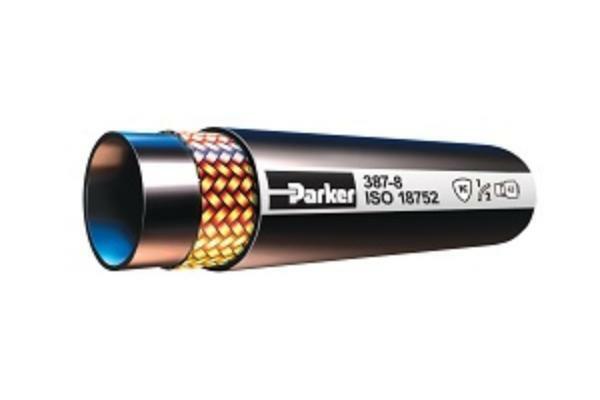 The Parker 387TC GlobalCore hose is a constant working pressure hydraulic hose offering 3,000 PSI in all sizes. This light, durable, and easy-to-bend hose meets and exceeds ISO 18752 performance specifications. The 387TC hose offers low force-to-flex and delivers full SAE-standard pressure at one-half SAE bend radius, resulting in easier handling and installation. 387 hose also offers a 30% smaller OD by area compared with SAE-standard spiral hose. Compatible with petroleum-based hydraulic fluids and lubricating oils, 387 GlobalCore hose is offered in sizes ranging from ¼-inch to 2 inches in diameter.